2013 was a tough year for investors in Puerto Rican municipal bonds. 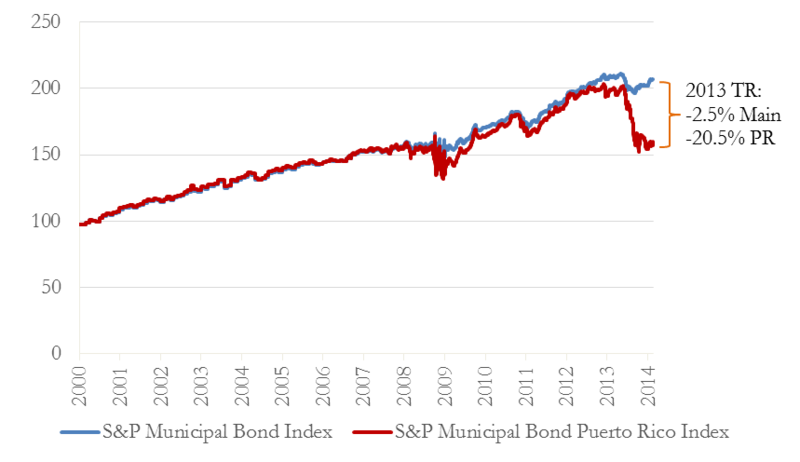 Figure 1 shows a broad index of U.S. municipal bonds--the S&P Municipal Bond Index--and a regional index focusing on Puerto Rican municipal bonds--the S&P Municipal Bond Puerto Rico Index. While both indexes moved in tandem from 2000 until 2012, the Puerto Rico index shows a much sharper drop in 2013 as the island’s economy continued its prolonged contraction. Puerto Rico’s 2012 GDP was 12% below its 2006 GDP, according to the Puerto Rico Planning Board. The total return for Puerto Rican municipal bonds was -20.5% in 2013, compared to a total return of -2.5% on the broad index over the same period. We have had several blog posts on the losses suffered by investors in the UBS Puerto Rico closed-end funds, which only allowed investments from Puerto Rico residents. But Puerto Rico municipal bonds also make up large fractions of the portfolios of many mainland mutual funds at least in part because Puerto Rico municipal bonds are typically exempt from federal, state, and local income taxes in all U.S. states. In this post, we focus on the Oppenheimer Rochester funds’ concentration in Puerto Rico bonds and the funds’ 2013 losses. The family of Rochester funds is made up of 20 municipal mutual funds, including five maturity-managed funds, two alternative minimum tax (AMT) free funds, twelve state-specific funds, and one high-yield fund. According to Morningstar, the Rochester funds have combined net assets of over $20 billion. The funds’ prospectuses do not limit the fraction of the portfolio allocated to Puerto Rico securities as even the state-specific funds which invest “mainly in municipal securities issued by its state” include tax-advantaged Puerto Rico bonds in their calculation of state municipal securities. Figure 2 plots the Rochester funds’ 2013 total return and the percentage of the portfolio allocated to Puerto Rican bonds on December 31, 2012. The figure shows that the funds with the highest exposure to Puerto Rican bonds at the end of 2012 had the most negative total returns in 2013. The Oppenheimer Rochester Virginia Municipal Fund (ORVAX), with over 35% of its portfolio in Puerto Rican bonds at the end of 2012, stands out with a -15.5% total return in 2013 (see red dot). Furthermore, it does not seem like the large losses caused by the Puerto Rico municipal bonds in 2013 can be offset by prior gains in such bonds. As Figure 1 showed, the Puerto Rico municipal bond index and a broad index of U.S. municipal bonds moved together up to 2012. 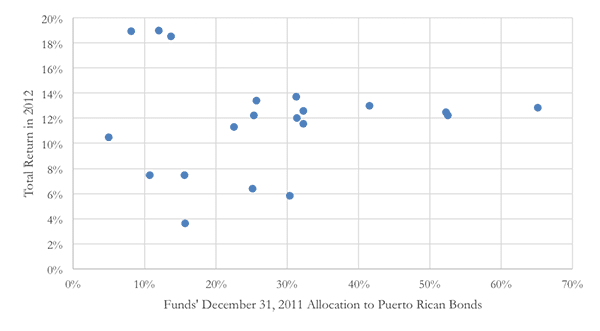 Figure 3 below shows that there is no relationship between the Rochester funds’ 2012 total return and the fraction of the portfolio allocated to Puerto Rican bonds on December 31, 2011. Although the funds’ filings disclosed investments in Puerto Rican debt, it is unclear whether investors were made aware of their exposure to the island’s limping economy and its looming debt crisis (see here). William Galvin, the Secretary of the Commonwealth of Massachusetts, has announced a probe into the sales practices and risk disclosures made by Oppenheimer and other large fund managers with high allocations to Puerto Rico debt. We think that the sales practices and risks representations made by financial advisors selling shares of the Rochester funds also merit investigation. (1) Data is from Bloomberg, unless otherwise stated. (2) The portfolios are obtained from the function <PORT HD> on Bloomberg. The fraction of the portfolio allocated to Puerto Rican bonds is the sum of the market value of the bonds issued in Puerto Rico as a fraction of the market value of all bonds in the portfolio. The market value for some of the bonds is not available on Bloomberg. On average, Bloomberg does not have market value data for roughly 13% of the securities in the funds. Such securities are excluded from the portfolio in the calculation of the fraction allocated to Puerto Rico securities. (3) The Bloomberg data on market values is more sparse for the December 31, 2011 portfolio, with 39% of the bonds missing a market value.